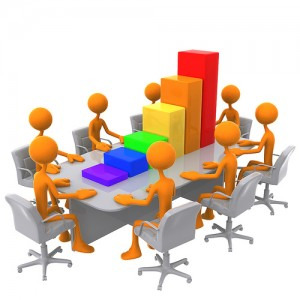 Can you build your business through weekly meetings that include customer and employee feedback? Two legendary stories I’ve heard suggest you can. These stories have been shared in our Gazelles coaches meetings by Verne Harnish and other experienced coaches. Wal-Mart stores grew through a consistent schedule of Saturday morning meetings with store managers and their executive team. Store managers provided their weekly numbers and discussions centered on what products were moving in the store. The meetings provided insight for Wal-Mart merchandisers to choose items that would dominate store displays and advertising for the week ahead. This routine practice provided the foothold to launch Wal-Mart into prominence. It helped to put them one step ahead of their competitors. Janie and Victor Tsao started Linksys [router systems] in their garage in 1988. Despite much larger competition including Cisco [who eventually purchased them] Janie and Victor managed to stave competitors off and become a leader in their industry. Each week Victor would gather information on his customers and review employee’s feedback, sift through the data and look for emerging patterns. Over time he was able to see issues and opportunities which Linksys continually capitalized on. He believed this weekly routine of gathering and pouring through customer and employee feedback helped him to stay 2-3 weeks ahead of their competitors. Linksys consistently launched innovations first to market enabling it to enjoy a powerful competitive edge in the marketplace. You may have noticed the influence of Strategic Discipline in both of these examples. Two further examples from my clients. One of my clients monitors NPS scores at the local level. Their managers are responsible for exceeding a specific NPS level each month. As a result of monitoring and improving their NPS scores, as each locations number improves so does its profit margin. Since adopting this practice two years ago company profits have increased dramatically. Another client worked diligently on his version of his company’s NPS score. They also chose an Average Speed of Answer metric to monitor since their business is driven by customer support turnaround time. An industry consultant recognized their outstanding support and response time when working with a client. His recognition helped get my client’s business into a prominent industry trade show displaying their system to prospective customers. The impact of that presentation helped drive sales in 2010 nearly 35% ahead of the previous year enabling record profits. In November of 2010 my client sold his business a goal he’d had for some time. All of this started with a dedication to customer service and a commitment to discovering qualitatively and quantitatively how customers perceived their business. Is it time you took gathering customer and employee feedback more seriously? Employee feedback drives performance. There’s a very small difference in how the best managers and leaders deliver positive reinforcement. We’ll explore that next blog.